Goin’ Down Slow is written in a twelve-bar blues style (where the lyrics are sung in three lines with the first two lines the same). A song sung by someone who knows he’s dying? A song that’s full of remorse? That has to be blues. Going Down Slow was was composed by pianist ‘St. Louis Jimmy’ Oden and first recorded in Chicago, November 11th 1941. Born in Nashville, Tennessee in 1903, Oden travelled to St. Louis aged 14, finding work in a barber shop. St. Louis had a thriving blues community and he found himself a place within it. A self-taught pianist, he never played professionally as he believed that there were many players better than him. He picked up his ‘St. Louis Jimmy’ nickname during this time, and was also known as Big Bloke, Poor Boy and Old Man Oden. Moving north to Chicago in 1933, Oden was active in the blues scene there, eventually making the first recording of ‘Going Down Slow’ with his friend, pianist Roosevelt Sykes. They recorded the song for Bluebird Records – a ‘budget’ record label that specialised in popular dance music such as jazz, blues and country. Bluebird records were famous for revolutionising the record-buying market in the 1930s with cheap imprints – ‘3 records for a dollar’. Bluebird songs were recorded cheaply and quickly using a regular pool of Chicago musicians which created a characteristic ‘small band’ style. This became known as ‘The Bluebird Sound’ and was hugely influential in the development of rhythm and blues and early rock and roll. Oden’s original version of Going Down Slow was typical of this, with a simple acoustic vocal, piano and bass trio. Professional musicians such as Oden and Sykes would have brought songs from their live repertoire ready trimmed to a suitable length to the budget-conscious Bluebird recording studio. I can’t help but wonder what it would have been like to hear Oden and Roosevelt play Going Down Slow in a club or bar. It’s likely the song would have been a little different each time they played it as they’d have jammed along together. Blues musicians are first and foremost entertainers who improvise and extend their music for the enjoyment of the audience (and dancers too). It’s impossible to imagine the frustration of songwriters and musicians needing to distil what would have been a much longer song into a three-minute recording, simply due to the technological constraints of the time. It was 8 years on, in 1949, that Ray Charles recorded the first cover of Goin’ Down Slow as his debut single (the ‘B’ side of Sitting on Top of the World). Incredibly, he was just 17 years old. Charles had established himself in the jazz clubs of Seattle after leaving his birthplace in Florida just the previous year. His version drops the ‘train’ verse and the addition of electric guitar gives it a more rhythm and blues style that Charles was starting to develop with his ‘piano trio’ format. Going Down Slow was given a more modern name ‘I’ve Had My Fun’ and was recorded at a time when Charles was still ‘finding himself’ musically. His music heavily reflected the influence of Charles Brown and Nat King Cole rather than his later (more refined) west-coast blues-gospel-swing style that was truly his own. Hip and pretty cool, huh? The next cover was recorded almost a decade later by New Orleans born barrelhouse piano player Champion Jack Dupree. 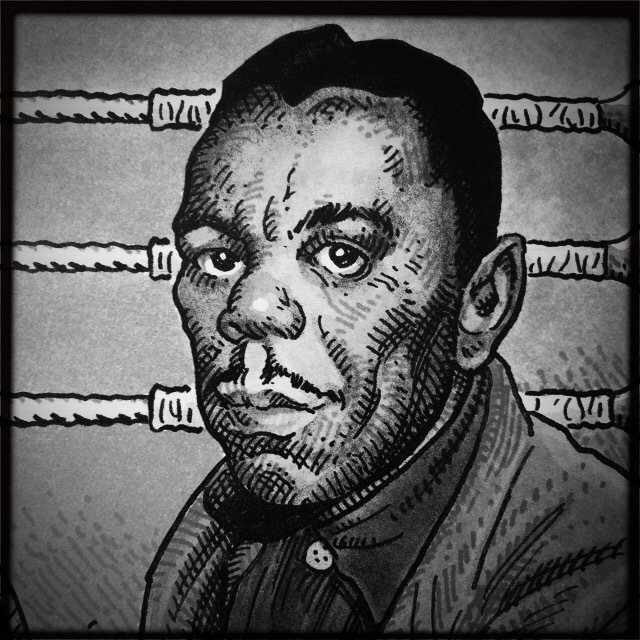 Dupree had an interesting life that included a spell as a boxer (which is how he came by his nickname) and as a cook in the US Navy during the Second World War. He also spent a couple of years in a Japanese prisoner-of-war camp. Musically, Dupree was known for his boogie-woogie piano playing and his recordings that showed the darker side of life. Goin’ Down Slow was included on one of my favourite blues music albums, his ‘Blues in the Gutter’ masterpiece album recorded in 1958 for Atlantic records. Dupree’s mournful vocals are layered over complex guitar rhythms and piano boogie. The drummer plays a slow and steady beat. Moody and melancholic. I can almost see the funeral procession. The Country Blues Revival in the 1960s led to many recordings by acoustic blues musicians. One example is Mance Lipscomb. Born in 1895, he spent most of his life working as a farmer, playing the guitar at local bars and parties during his spare time. Influenced by fellow Texas bluesman Blind Lemon Jefferson, he had a fingerpicking guitar playing technique and sang as his own accompaniment. Lipscomb gained popularity after his ‘discovery’ and was a regular performer at festivals and folk-clubs during that era. Lipscomb’s recordings are a testament to that as his albums featured not only blues but folk, ragtime and popular songs from ‘tin pan alley’ (vaudeville theatre). I love the pared back simplicity. One man and his guitar. Wolf’s earliest and greatest influence was the Delta blues king Charlie Patton, star of the juke joint and plantation dance circuit in the 1920s. Patton was a notorious and riotous entertainer, playing ferocious rhythms with roaring vocals, and packed in audiences wherever he went. Wolf developed his own style throughout the 1930s, performing both solo and alongside other Southern travelling blues musicians of the time. These included Sonny Boy Williamson II (whose hard-hitting rhythmic harmonica style he emulated), Robert Johnson and Son House. By the end of the decade, he was pioneering a modern sound with a neck-rack harmonica and a very early electric guitar. After a spell in the army in the early 1940s, Howlin’ Wolf moved to Memphis and settled down to life as a farmer. He picked up his blues playing where he’d left off, this time forming a band with electric guitarist Willie Johnson. Johnson’s explosive guitar combined with Wolf’s growling vocals created a deep, compellingly aggressive sound. By the end of the decade, he’d released his first two records, and was being hounded to sign a contract with Chess Records. 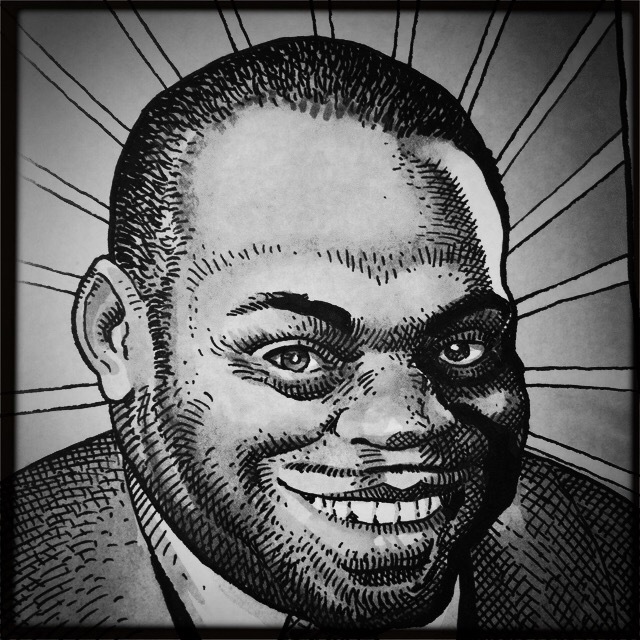 Willie Dixon was an all-around musical genius who shaped the Chicago sound with his bass playing, song-writing and inspired arrangements. His earliest influences included his mother (who often spoke in rhyme), learning work-songs on prison farms, and singing bass in harmony with a gospel quartet. As a professional musician, Willie Dixon was prolific. Think of a famous Chicago blues song, and he almost certainly had a hand in it. Howlin’ Wolf and Willie Dixon began working together in 1960 and collaborated together for five years. The combination of Dixon’s lyrics, Wolf’s vocals and Sumlin’s lead guitar sold a lot of records. Their 1961 studio work included an astonishing rendition of Goin’ Down Slow. Working as an inspired and original song-writing unit, Wolf and Dixon removed the last two verses, replacing them with two completely new ones and thereby changing the entire tone and feel of the song. This puts a completely different spin on the meaning of the song. (Especially the Mmmmmmm-mmm!) There’s no regret here. At least, not until Wolf starts to sing. He moans and growls the remorseful verses from the original song, and brings in all the pain and suffering of a dying man. Just when you think it’s all over, Dixon’s final verse brags about all the women he’s known and the money he’s spent. Born in 1942, Aretha Franklin was singing in front of her preacher father’s Detroit congregation by the time she was 14 years old. A gifted pianist with a powerful voice, her most distinctive and memorable music was recorded after she signed with Atlantic Records in 1966. Recording with a consistent team of backing musicians (including saxophonist King Curtis) allowed Aretha’s voice to truly shine, and she was finally able to express her musical roots and develop her own unique gospel-infused soul-blues sound. Aretha’s interpretation of Goin’ Down Slow changes it completely. Never released as a single, it was part of her second Atlantic album ‘Aretha Arrives’ and later included on the outstanding compilation album ‘The Delta Meets Detroit: Aretha’s Blues’. It’s still blues, but she takes it back to church. The radiance and power of Aretha brings repentance and the promise of redemption. As she sings each line, she echoes and agrees with herself, as though she were her own congregation. ‘Oh yeah…’ ’Mmmhm…’ The band know their place. They know when to play softly (at times you almost have to strain to hear the organ and the saxophone) and they also know exactly when to bring on the glory! Wow. She really was the Queen of Soul. British rock groups such as The Rolling Stones and Cream were heavily influenced by Chicago blues and played their own versions of blues standards alongside their own material. The Howlin’ Wolf London Sessions album came about after Chess producer Norman Dayron spontaneously approached UK rock guitarist Eric Clapton and asked him if he’d like to record with Wolf in London. The Sessions were set up at Olympic Studios with Clapton insisting that Wolf’s long-time guitarist Herbert Sumlin be flown out from Chicago so they could jam together. The harmonica was played by Jeff Carp and Ringo Starr played the drums. Astonishingly, the take of Goin’ Down Slow was one of three songs that ended up on the cutting room floor and was not released on the London Sessions album. Luckily for us, it WAS included in a 2003 Deluxe edition of the album. Sorrowful harmonica weaves around the inspired guitar playing from Sumlin and Clapton while Wolf growls over the top. I just l-o-v-e this version. It has so much depth and the rapport between the musicians is incredible. I feel like I’m right there with them. Another blues-rock cover was recorded live from Monterey Jazz Festival in 1972: a collaboration between Jimmy Witherspoon and rock guitarist Robben Ford. Born in 1923, Jimmy Witherspoon was a rare singer at home in many musical genres. He began his career as a blues shouter with a James McShann’s big band playing in the ‘jump blues’ style that dominated the West Coast jazz and blues scene during the 40s and 50s. Through the 1960s he explored other styles of music and released on several different record labels before he eventually found a new niche playing with rock guitarist Robben Ford. ’Spoon’s deep and gentle yet powerful voice made him a natural late night blues singer, and Ford’s guitar is a perfect match. This performance of Goin’ Down Slow is a full 8 minutes 27 seconds. That sounds way too long, but just take a listen. I promise time will stand still. Bobby Bland was a blues singer best known for developing a rich Southern soul sound that blended gospel with blues and R&B. Born 1930 in Tennessee, he was a natural storyteller, who used his voice as an instrument, creating emotional renderings about love, heartache and betrayal. 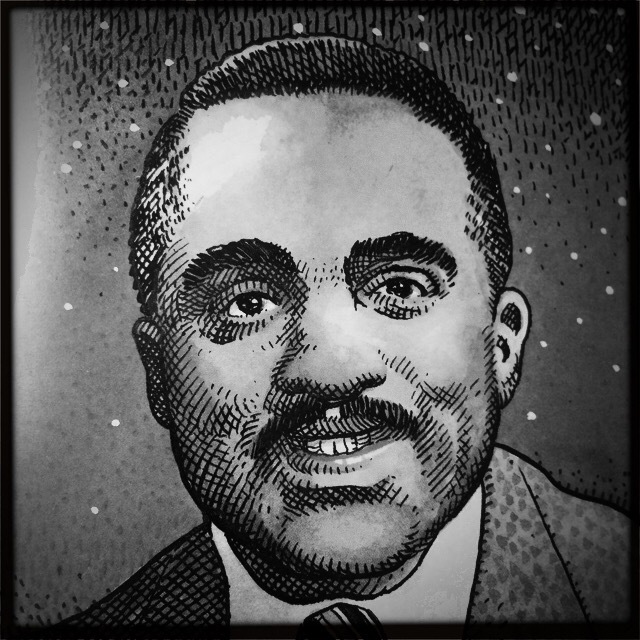 Interestingly, Bland developed his distinctive vocal style from listening to and studying the recorded sermons of the Detroit preacher, CL Franklin, Aretha’s father. Most of Bland’s popular hits were recorded during the early 60s, but he continued to tour throughout the 70s for his huge following of (mainly female) fans. He was also able to make something of a comeback during the early 70s with a couple of hits. This included reaching number 17 in the US R&B charts with his 1974 release of Goin’ Down Slow. Just listen to that deep soul-blues as Bland lets himself loose over a hard-hitting bass line, rousing horn section and female backing singers bringing a touch of gospel. The emotion that Bobby brings to this song is intense. The effect is almost orchestral. 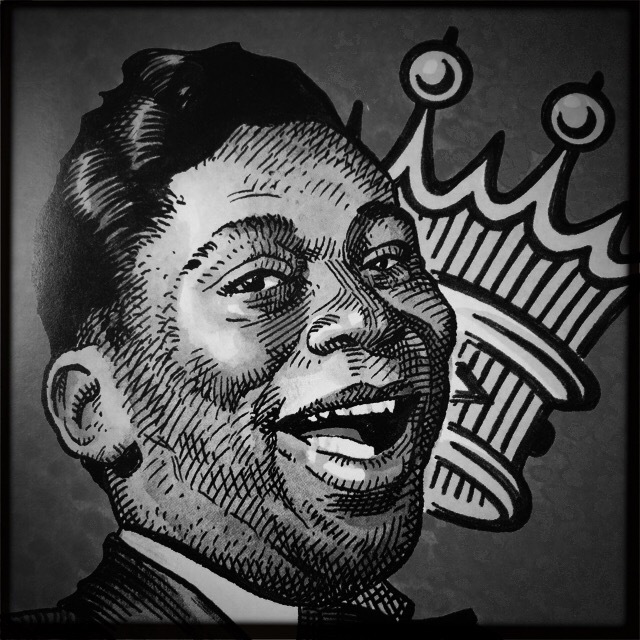 Riley ‘B.B.’ King was born in Mississippi in 1925 and is considered one of the most influential blues musicians of all time. King was continually on the road as a performer, and with a long string of hits, his career continued to evolve throughout his life. B.B.’s guitar playing was characterised by his staccato picking style, and the fact that he would never sing and play the guitar at the same time. Listen carefully and you can hear it. I am a huge fan of B.B. King live recordings, especially his duets with other artists. This recording of Goin’ Down Slow with Bobby Bland begins with an extended guitar solo from B.B. supported by a gentle backbeat. Bland sings the first two verses, B.B. sings the next. In the fourth verse, they go into battle! Listen to them play with call and response, both taking turns with the guitar in classic B.B. King style, building to a huge crescendo with the horn section creating a dramatic (and fairly abrupt) ending. The combined energy of these two blues giants is the potent blend of soul and blues. Just wonderful. The most recent (and experimental) cover of this song I’ve found was recorded in 1996 by the band Little Axe. Little Axe is fronted by Skip McDonald whose music career began in the house band for Sugarhill Records, playing on early rap with Grandmaster flash. His later projects included a collaboration with tabla player Talvin Singh. The Little Axe version of Goin’ Down Slow is funky and edgy, layered with the sounds of dub and world music. I also hear the influence of some of the more experimental blues artists such as Buddy Guy and Shuggie Otis. This song has evolved far from the original but is still recognisable as blues. For the last word on Goin’ Down Slow, I’d like to introduce contemporary blues artist Eric Bibb. With an African-American background and currently based in Sweden, Bibb is known for collaborating with other artists to bring a fresh perspective to blues standards and gospel numbers. It was impossible to include all the covers that I listened to while preparing this post and there are many other noteworthy versions of Goin’ Down Slow that I have regrettably not included in my analysis. I’ve included some of them on the playlist. 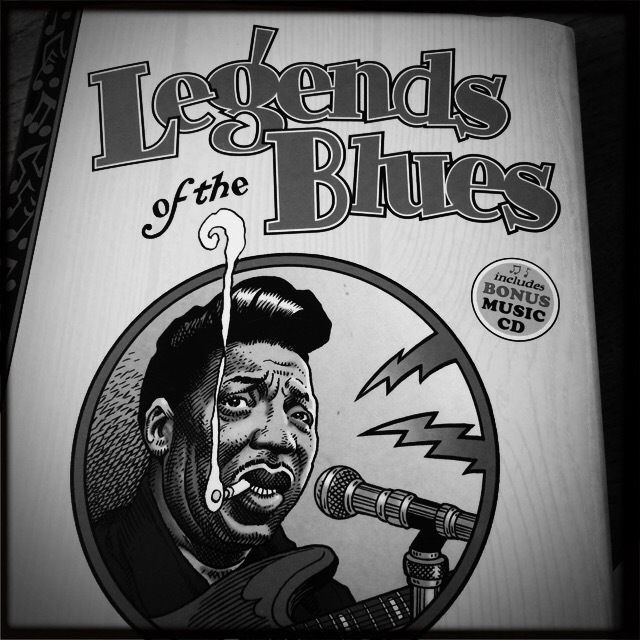 The pictures are my own photos of drawings by William Stout, in his book Legends of the Blues.